Experience the Baltic on an escorted vacation visiting Estonia, Latvia, and Lithuania. Begin in Vilnius, known for its more than 1,200 medieval buildings and churches. Enjoy a walking tour of the Old Town and marvel at the rich architecture. 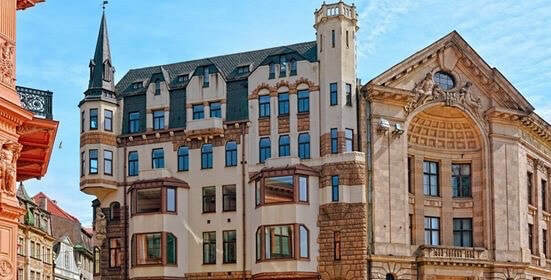 Continue on to Riga where you will enjoy a walking tour visiting Riga Castle, St. Peter's Church, and the Swedish Gate. You will also have a day at leisure in Riga where you may opt to explore the Gauja National Park or the Ethnographical Open Air Museum. Travel on to Tallinn which offers a charming blend of medieval tranquility and modern urban life, where you will tour the city and visit highlights such as Toompea Castle and the Great Guild Hall. Upon arrival, you will be met and transferred to your hotel. Tonight, enjoy a welcome drink and meeting with your tour director at the hotel. $845 pp based on double occupancy. Ask about confirmed air options. DAY 2 WELCOME TO WARSAW. DAY 3 - RELAXED START EXPLORING THE PROUD POLISH CAPITAL OF WARSAW. (Relaxed Start) A Local Expert will show you how well the Polish capital was restored after almost complete obliteration during World War II. This incredible restoration can be credited to the amazing detail of Canaletto’s paintings! Pass the tiered Palace of Culture and stroll through Łazienki Park to the Chopin Memorial. Take a moment to reflect at the Ghetto Heroes Monument. Then walk to the Market Square in the Old Town. The rest of the day is yours to enjoy at leisure. Don’t miss the chance to visit Wilanow Palace, the residence of Polish King Sobieski, known as Victor of Vienna. Perhaps attend an exclusive private recital of Chopin music by a celebrated Polish pianist? Hotel: Sheraton Warsaw Hotel. Meals: Buffet Breakfast. DAY 4. VILNIUS, VENERABLE CAPITAL OF LITHUANIA. DAY 5 - RELAXED START VILNIUS AND THE ISLAND CASTLE OF TRAKAI. (Relaxed Start) Start your morning at the Baroque Church of St. Peter and St. Paul before moving on to see the neoclassical cathedral. Join your Local Expert for a leisurely walk through the Old Town and see the Jesuit University, the Gates of Dawn and the former Soviet KGB headquarters, a reminder of grim and relatively recent events. A highlight of our travels will be your visit to the fortified island castle of Trakai, originally built in the 13th century and now restored to all its glory. DAY 6 SIAULIAI AND THE ART NOUVEAU NIRVANA OF RIGA. DAY 7 RIGA SIGHTSEEING AND ON TO TALLINN. Explore Riga’s Old Town with your Local Expert, visit the Domkirk and see the city walls, the House of the Three Brothers and the castle of the Livonian Knights. Your travels continue along the shores of the Gulf of Riga and across the Estonian border to reach Tallinn, hailed by travel aficionados as the New Prague.